Today, Wednesday 12 October 2016, the University of Southern Queensland (USQ) has entered Watershare, a consortium of several of the world’s most reputable water research organizations that share the goal of applying global expertise to local water challenges. 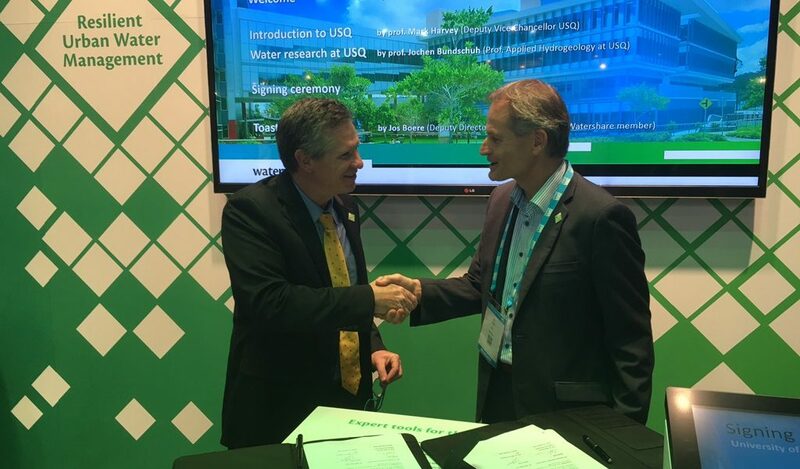 During a ceremony at the Watershare smart-space linked to the IWA World Water Congress & Exhibition in Brisbane, Professor Mark Harvey USQ Deputy Vice-Chancellor, Research & Innovation and Mr Jos Boere (Deputy Director KWR, coordinating Watershare member) signed the membership agreement. 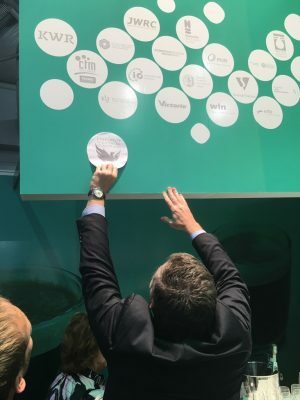 Members share their research activities and outcomes to allow each other to use their findings for continued research applications into projects. Through USQ, Watershare members have better access to Australian water knowledge and applications. Many advanced water management concepts and solutions originate from Australian research such as frameworks for Water Quality Risk Management and Water Sensitive Sites. In turn, USQ will benefit from the knowledge and competences among platform members in shaping and implementing its applied research projects. With USQ on board, Watershare now includes 18 members in Europe, South Korea, Singapore, Mexico, South Africa, Japan and Australia.